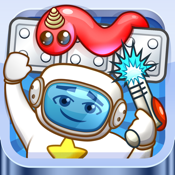 Blastronaut is an epic 2d platform game complete with 32 incredible levels, 4 unique worlds and a cast of challenging enemies. Sometime in the not so distant future, a young boy is marooned and alone in a mysterious alien universe. A boy that now has to be brave and become a man - Blastronaut is lost in space! One year ago today, a curious rookie astronaut set foot on his first voyage with his fellow crew members. Little did they know what lurked in the deep pockets of space and one fatally wrong move separated Blastronaut from the rest of his crew, sending him spiralling into alien planets. Now stranded, Blastronaut must navigate his way home through these foreign worlds and come up against his greatest fears. Far from an easy journey lies ahead of him and using all of his training he must jump, run and Blast his way through whatever stands before him. He will quickly realise that he is not alone and despite a cute exterior, a deadly enemy awaits him, trying to stop his every move. He must survive and make it home and you have been chosen to help him. Will his new found enemies and alien world stop him, or will you help him on the long and hard journey back home to Planet Earth. We hope you enjoy the game. Have fun and help Blastronaut return home.